Evan Eastham, location manager for the HBO series "True Detective," explains the equipment used and the staff expertise needed to shoot a scene for the cable series. FAYETTEVILLE, Ark. 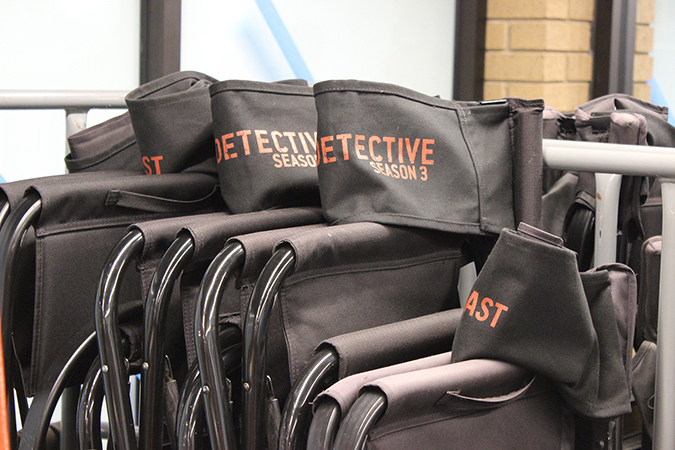 – University of Arkansas students and staff recently watched an experienced, professional film crew set up and shoot scenes for the HBO series True Detective: Season 3, which was on location at the Global Campus in downtown Fayetteville. 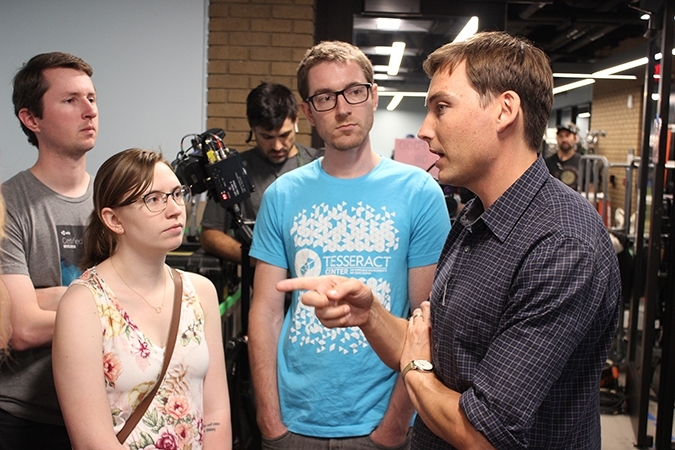 Evan Eastham, location manager for the HBO series, escorted small groups of students and staff to the southwest corner of the fifth floor of the Global Campus building to let them watch professionals in action. Eastham whispered as he explained the equipment, described the roles of staff and answered questions. Eastham provided the tours for educational purposes. Random Productions LLC is shooting the third season of the series, which was created by Nic Pizzolatto, a graduate of the U of A Program in Creative Writing and Translation. This season is set in the Ozarks, so much of the shooting is taking place at locations throughout Northwest Arkansas, including many locations in Fayetteville, Bentonville, Lincoln, Rogers and Springdale. The crew set up to shoot a scene in the Global Campus Building on May 6, filmed scenes May 7, and removed everything on May 8. Ambrosia Johnson, a student intern at the Global Campus and recent broadcast journalism graduate, said she was intrigued by the number of teams needed for a shoot. “There was almost like this body language in their communication,” added Greg Rogers, the design and narrative lead on the Tesseract Center staff. “When you’re paying attention to the details, the viewers are not having to make some cognitive leap to get into the magic circle,” Follett said. Donald Judges, vice provost for distance education, worked with Provost Jim Coleman and the U of A’s legal counsel to gain approval for HBO to shoot scenes in the Global Campus Building. 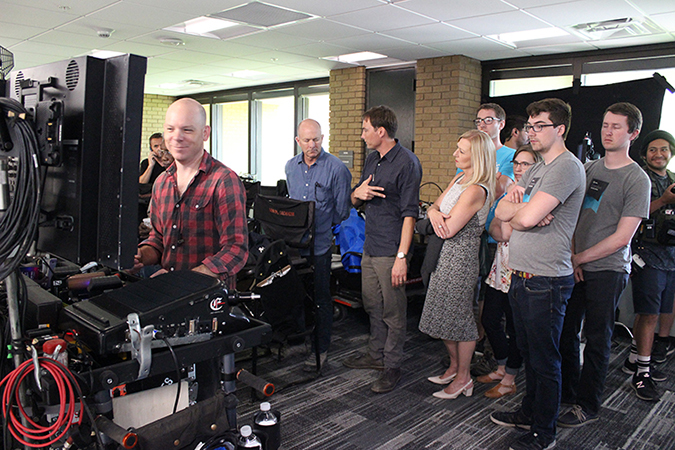 HBO’s location team toured the newly renovated Global Campus Building and learned what students and staff do in the media production suite, the production studio, the instructional design and learning technology suites, and other parts of the building. The Global Campus teams provide creative, innovative support to academic colleges for the development of online courses and programs, as well as on-campus courses that use learning technology. Teams provide digital content, animation, online pedagogical strategies and help with learning technology, including Blackboard Learn, the U of A’s learning management system for classes online and on campus. About the Tesseract Center: The Tesseract Center for Immersive Environments and Game Design launched in 2015, although its work began years earlier under the guidance of David Fredrick, who leads the center. The center provides a computer lab and infrastructure to support educational projects that foster entrepreneurship and economic development through the creation of intellectual property. U of A students learn skillsets in 3D asset creation, interaction design and coding, and virtual reality content creation. The center operates under the Office of Research and the J. William Fulbright College of Arts and Sciences.